Hewitt Homeschooling has long in my mind been a producer of great homeschool literature products. Their quality Lightning Literature guides give students what they need to be successful at comprehending and responding to great literature. No Graven Image $14.99. This particular guide is geared for 11th-12th grade students. 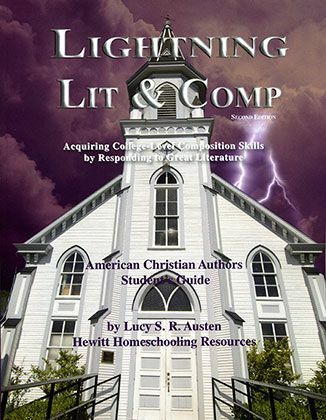 I was familiar with Hewitt Homeschooling and Lightning Literature from my oldest son when he studied British Literature in his 11th grade year. He is now in his second year of college, and I was so thankful that he has some of the skills he needed for that first English class. Basically no matter what your degree desires are, you will be taking English classes and they will require very similar activities to what Lightning Literature teaches. You read poems, or other literary works of writing, then respond to them in essay form. If you are not prepared for this level of writing, it will be very difficult to get through that first class. Knowing that with my oldest, I was thrilled to have the opportunity to review for Hewitt Homeschooling with my now 12th grader. I want him to have the same preparation for college that his brother did. I highly recommend starting at even a younger age with some of the other studies if possible. We had to do some basic essay learning prior to 12th grade so we are just now getting into the Lightning Literature. We started with Anne Bradstreet's poems, from the mid 1600's. It was very helpful to have the teachers guide while we worked through these poems. The language in that time was very different and even I struggled at times to decipher some of the words. This literature guide is best used with student and parent working together to talk through some of the works. After each author's work and comprehension questions there were several writing assignments to choose from. I was thankful for the variety, as some may work better with different style of kids. In the back of the book is a schedule guide. You can use this guide for one semester or for a year. We chose to make it a year because of all of the reading and intense writing assignments. This program is not for the weak of heart! The work is tough, which is good, because college is tough!! Many of the works are in the Lightning Literature guide. There are 4 additional books you will need, that you can either purchase or get at the library. We were given No Graven Image along with our review. I easily ordered the other three to have on hand for the semester. Hewitt Homeschooling is one of those curriculum that I highly recommend. I know there is a huge choice today in writing and literature. I have really been pleased with the push that this gives to the high school student to work beyond what they may feel capable of doing. It challenged me as a parent as well, which is going to be so worth it when he gets to that first English class of college and will know what is expected of him, and has the confidence that he can do it. Hewitt has a large variety of curriculum that the Schoolhouse Review Crew was able to sample. Click on the banner below to see what their thoughts were!